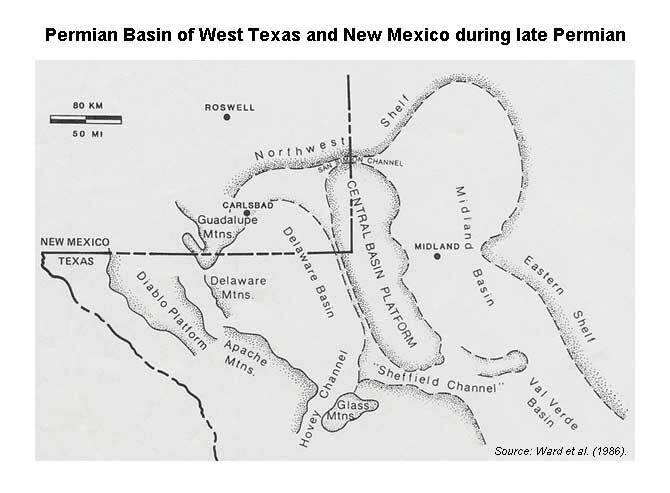 The tectonic history of the Permian Basin has a direct implication on the accumulation and preservation of the vast hydrocarbon reserves of the Guadalupian stage. The structural development of the basin is generally be divided into three stages: the first stage encompasses the Cambrian through Mississippian in which the region was a broad marine basin in which vast carbonate and clastics deposited, this is the Tobosa basin. 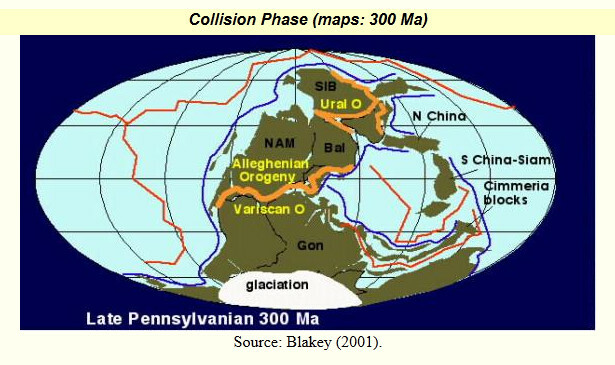 The second stage of tectonic evolution of the Permian Basin was initiated by the Hercynian Orogeny in which the North American Craton collided with the South America from Early Pennsylvanian through Early Permian. This orogeny caused the basin differentiation into deep basins surrounded by shallow shelves. The third stage of the basin development was initiated when the basin became structurally stable and vast deposits of clastics deposited in the deep asymmetrical basins and carbonates deposited on the shelves. This chapter provides a brief overview of the tectonic development of the Permian Basin in order to gain some understanding of the primary processes that caused the basin to differentiate and to subsequently cause reciprocal sedimentation of clastics and carbonates. The lower Paleozoic passive-margin succession is present throughout the southwestern region of the United States and is as much as 1.5 km thick (Sarg et al., 1999). 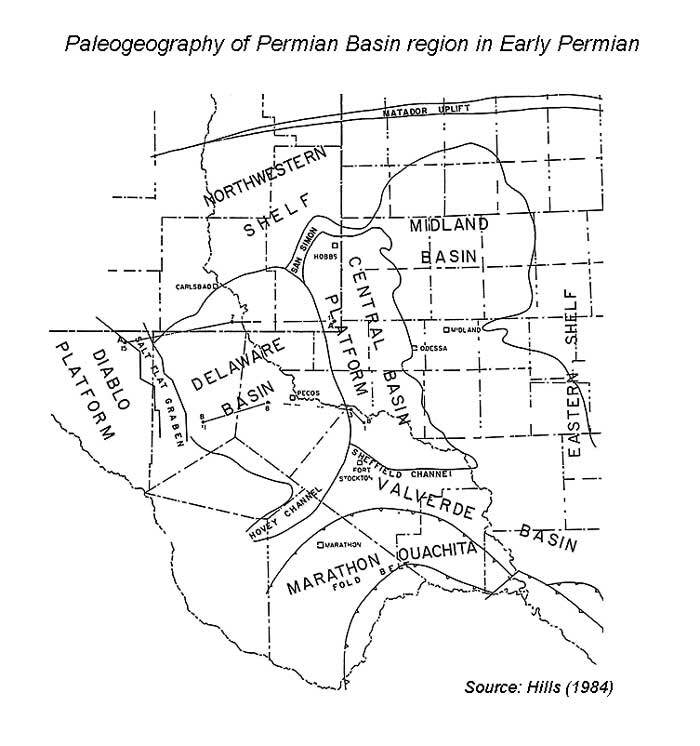 This ancestral Permian Basin was characterized by weak crustal extension and low rate subsidence (Horak, 1985). A broad, shallow, gently dipping depression known as the Tobosa Basin developed (Galley, 1958). Sedimentation consisted mainly of relatively uniform and widespread shelf carbonates and thin basinal shales (Hills, 1984). Transcontinental arch extended across southeastern New Mexico and west Texas. The tectonic evolution of this area caused the collapse of this arch as a negative feature, where the early Ordovician sea transgressed, producing a flattened coastal plain (Adams, 1965). The tectonic evolution of the area involved a conversion of the crest of this peninsular ridge into the axis of a negative basin. The sagging of this arch was caused possibly by cooling and shrinking of the underlying crust and mantle rocks. Early subsi­dence of the peninsular arch proceeded too slowly to produce a structural basin. It produce a flattened coastal plain across which the Early Ordovician sea slowly transgressed (Adams, 1965). The northwest-ward-transgressing Early Ordovician, Ellenburger Sea spread a wedge of sediments across the Texas-New Mexico area. Sediments deposited in the offshore areas consist of evenly Bedded shelf carbonates resting on thin near-shore clastics. These coarse basal clastics were derived from weathering of the underlying basement. The carbonate shelves were wide and shallow. Cross-shelf circulation was limited and minor amounts of evaporites were deposited in the more restricted areas. As a result most of the limestones were dolomitized soon after deposition. Non-dolomitized limestones, however, are common in the offshore areas and tongues of limestone are preserved in the shelf sections. Progressively younger beds onlap the basement toward the northwest. As a result the section thins from 2,000 feet at the south to zero just north of the Delaware basin. The axis of this Tobosa sag coincided approximately with the axis of the pre-Ordovician highland on which the sag was superimposed. Toward the south the Tobosa Basin opened into the deeper Marathon embayment through which the ocean waters circulated. 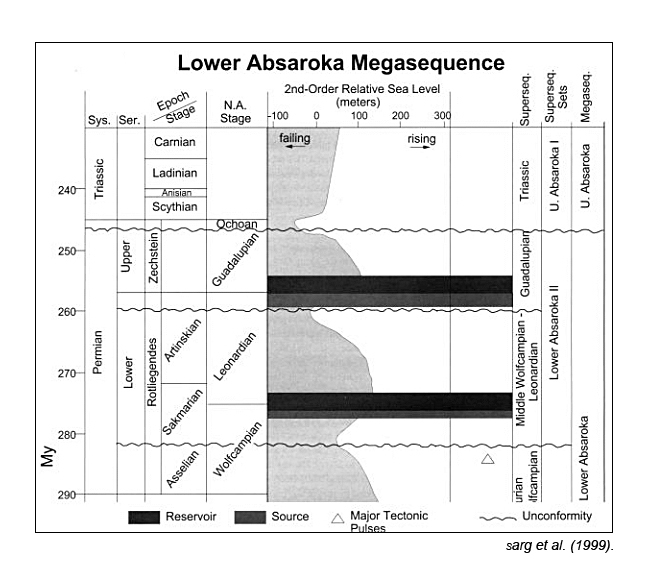 A lens of mid-Ordovician, Simpson sandstone, shale, and limestone accumulated in the lower parts of the Tobosa sag (Adams, 1965). Crustal warping in later stages of the Early Ordovician divided the widespread Lower Ordovician shelf into a series of sags and arches. A mid-Ordovician 350-mile-wide sag, the Tobosa Basin developed between the Texas arch on the east and the Diablo arch on the west (Adams, 1965). This region was welded solidly to the southwestern portion of the Craton and sank gradually to form the shallow Tobosa Basin (Hills, 1984). 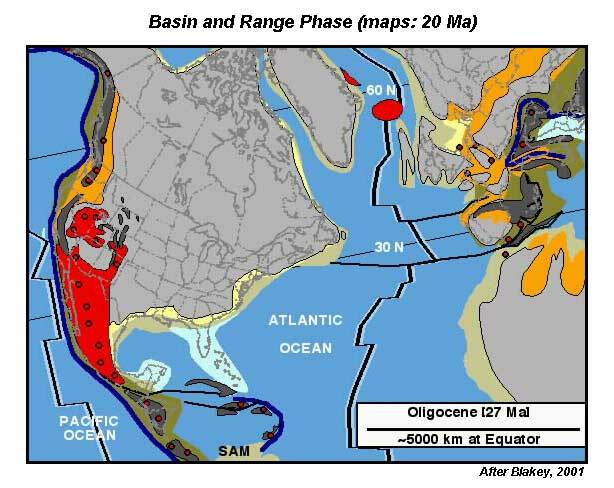 By Middle Ordovician, the shales and limestones of the Simpson formation covered the southern part of the present North American Craton (Scotese et al., 1979). This formation is composed mainly of sandstone, shale and limestone and shelf limestone in the south. In many places, the total thickness of the Middle Ordovician reaches almost 600 m, about 50% of which is shale. During Late Ordovician, Silurian, and Devonian, the axial areas of the Tobosa Basin generally were sites of relatively deep water. The waters were too deep or too acidic for extensive limestone deposition; clastic supplies weren't enough to match subsidence rates and many areas of the basin starved. The subsidence rates were variable, so sometimes, marginal limestone shelves forestepped seaward and sometimes the basin expanded landward. dolomite and white chert occurred in the shelves, limestone and dark chert in the deep waters and shales in the talus slopes. The black shales deposited in these seas contain large amounts of organic material, much of which is preserved as carbonaceous residue. In many places, black shale deposition continued into the Early Mississippian (Hills, 1984) and (Adams, 1965). Slight uplifts and erosion in Late Devonian time exposed the marginal Silurian-Devonian and Upper Ordovician shelf deposits to truncation. 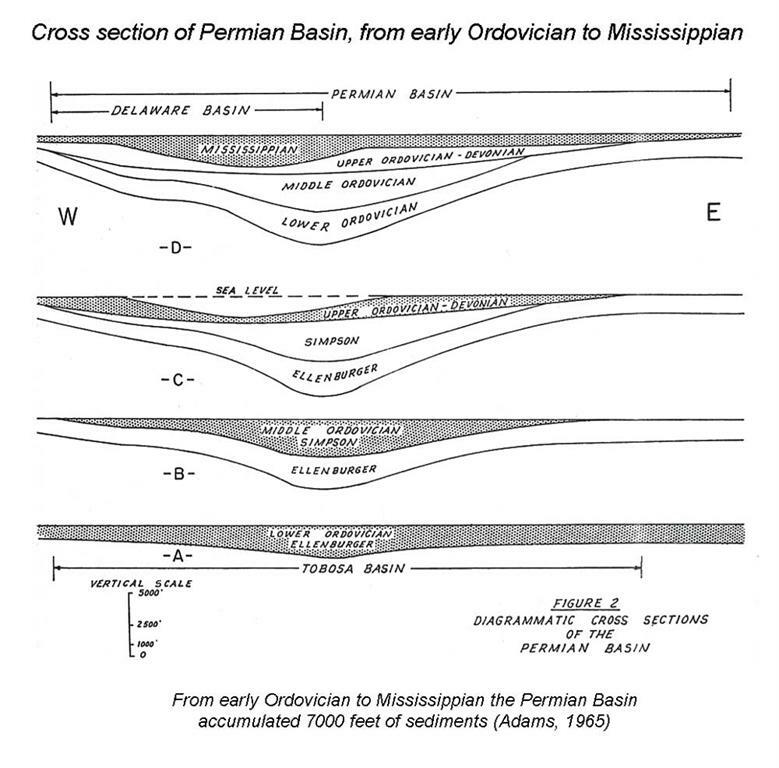 The Early Mississippian transgression deposited the Woodford shale, an important oil source for the pre-Mississippian reservoirs (Adams, 1965). Deposits covering most of the southern Tobosa Basin consist largely of dark gray and brown clay shales. Maximum thickness of these shales along the axis of the Tobosa sag presented up to 7000 feet of sediments on its deepest parts. These shales filled the starved Devonian depressions and the surrounding shelf areas almost to wave base. The development of a median ridge split the Tobosa sag into the Midland and Delaware Basins at the same time the area of active basinal subsidence was extended northward into Kansas. The name Permian Basin is applied to this segmented and greatly expanded negative area (Adams, 1965). The geometry of the Permian Basin consisting of two sags separated by a platform was established during this phase as a result of the Hercynian collisional orogeny. 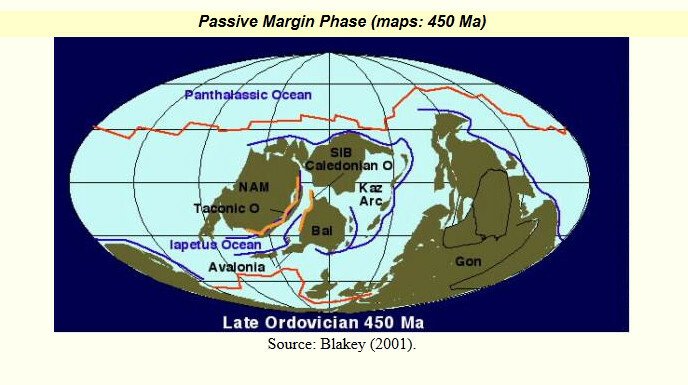 The Hercynian orogeny was initiated by the collision of North America and Gondwana Land (South America and Africa). This collision gave rise to the Ouachita - Marathon fold belt and deformed the ancestral Tobosa Basin intensively deformed along high - angle basement faults and pre-existing zones of weaknesses (Horak, 1985). Rapid basin subsidence and sedimentary filling took place during this phase. 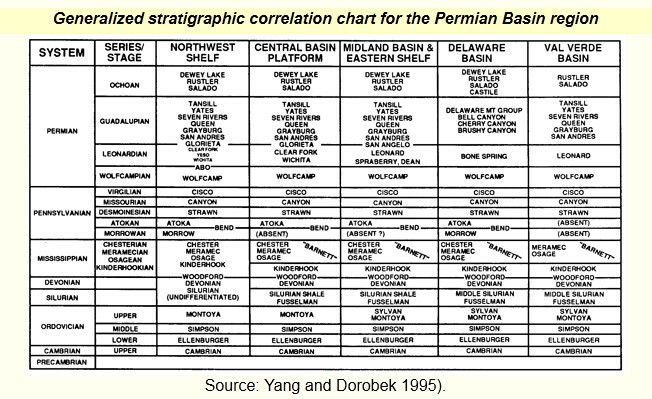 Broad carbonate shelves became established on the western, northern, and eastern margins of the Permian Basin and Central Basin Platform as a result of its equatorial location during this phase. 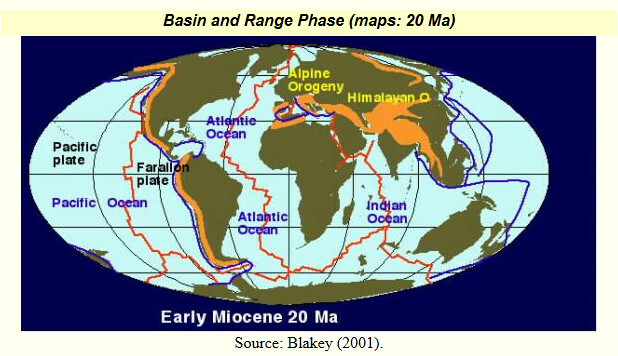 Clastics meanwhile dominated in the basins. By Late Paleozoic time the original Tobosa Basin was divided into the northwest-aligned foreland basins (Delaware Basin, Midland Basin) with intervening high areas (Central Basin Platform and Diablo platforms) (Sarg et al., 1999). Vertical movement along the lines of Proterozoic weakness deepened the eastern portion of the incipient Delaware Basin and tilted it to the east. Compression from the southwest caused the Central Basin ridge to rise along rejuvenated steeply dipping reverse faults. 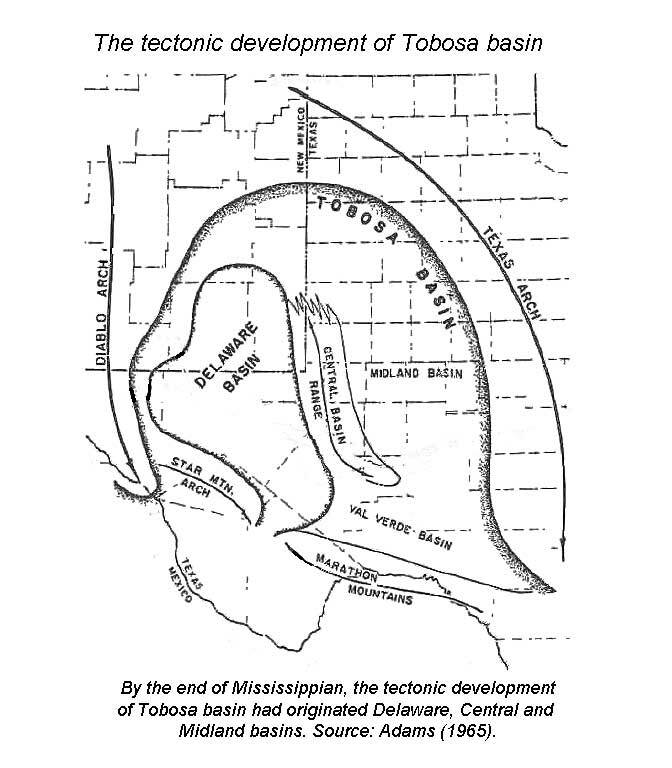 Folding, which apparently involved the basement, began to deform both the basin and the Central Basin uplift, and split the Tobosa Basin into Delaware Basin on the west and the Midland Basin to the east (Hills, 1984). At this time the basin underwent rapid subsidence resulting in extensive deep areas. The central and south areas were sediment starved, and were later buried under shallow platform carbonates. 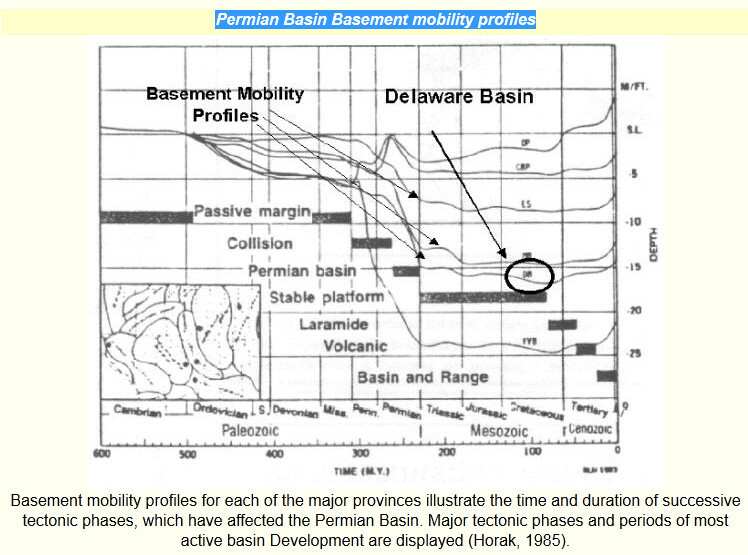 The Delaware Basin during underwent a rapid subsidence which produced extensive bottom areas too deep for limestone deposition. Clastic supplies within much of the Permian Basin were limited. Some of the eroded limestone was dissolved during transit or soon after deposition in the deep, cold basin waters. Clastic deposition occurred on the north and northwest margins, the central and southern parts of the basin were mainly areas of starved shale deposition as a result of deepening (Adams, 1965). Tectonic activity increased throughout the region, including the Marathon fold belt. Broad carbonate shelves grew along the basin margin. The trapping behind the carbonate banks of clastic material derived from the northeast highlands resulted in the starving of the basins. Compaction of the basinal sediments and development of unventilated bottoms in the deep Delaware Basin preserved the remains of organisms that flourished in the shallow photic zone and on shelf margins (Hills, 1984). Characterized by rapid basin subsidence which permitted huge accumulation (over 8,000 feet) of turbi­dites that produced enormous compressional stresses in the underlying crustal rocks. The median fault-block range between the Delaware and Midland Basins was squeezed upward several thousand additional feet. The stable Diablo arch on the west was raised to mountainous heights. This combination of rapid basin subsidence and rapid rising on its margins provided the accommodation space and clastic sources. Along the eastern, western, and southwestern margins sediments include thick beds of chert, limestone, and arkosic boulder beds with sandstone shale, and detrital limestone. Most of these clastics were probably distributed by turbidity flows sweeping down the steep flanks and spread­ing across the deep bottoms. 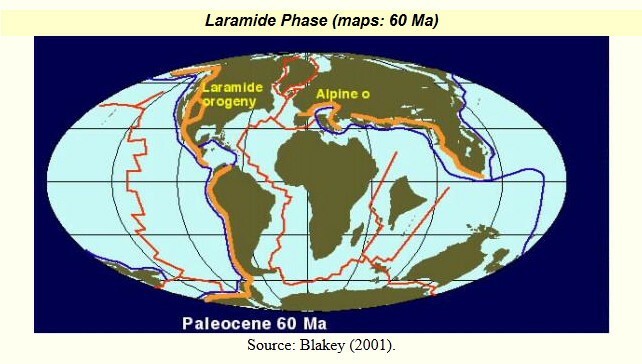 Most of the clastics came from rising moun­tains on the northwest, west, and southwest (Adams, 1965). A shallow carbonate shelf and margin developed around the edges of both the Delaware and Midland Basins (northern, northwestern, and northeastern). Shelf-edge reefs grew along the seaward edges of these shallow shelves during stages of still-stand or slow subsidence. As clastic supply decreased in the late Wolfcampian, the limestones were replaced by carbonate beds totaling several thousand feet in thickness. The rate of subsidence of Delaware and Midland Basins decreased substantially, and a reduced sediment supply was reduced as a result of the leveling of the mountains on the west and northwest. basinal deposits consist largely of dark limestone, shale, and fine-grained sandstone. The slowly rising median ridge on the east was completely capped by Bedded shelf limestones. The name Central Basin Platform (CBP) generally is applied to this intra-basin limestone bank. This ramp-type shelf was already developing a series of barriers along its seaward edge, thus becoming a more distinct rimmed margin. carbonate shelves continued to develop and basinal circulation was severely constricted. Circulation through channels in the carbonate shelf and through the Hovey channel and Val Verde Basin to the south kept the surface seawater aerated and organically productive. Limestone shelves bordered by reefs spread across the Star Mountain arch toward the south and the Diablo arch toward the west. The broad shelves west, north, and east of the Delaware Basin were sites of widespread restrict­ed lagoons in which evaporites were deposited. In the late Leonardian, clastic supplies reaching the basin increased because of renewed uplifts on the northwest and subsidence in the Delaware Basin. The coarseness of these sandstones was greater than earlier in the epoch (Adams, 1965). Basinal subsidence slowed down during the Guadalupian. From the late Wolfcampian through Guadalupian (Late Permian), the Midland and Delaware Basins were principally sites of siliciclastic accumulation, whereas the platforms and shelves were sites of carbonate deposition. During the middle Guadalupian, the Eastern shelf, Midland Basin, and Central Basin platform ceased to be areas of carbonate accumulation and instead became sites of cyclic deposition of sandstone, anhydrite, and halite (Ward et al., 1986). Guadalupian rocks around the margins of the Delaware Basin consist of reef-bordered limestone shelves. Deposits within the deep central basin are largely terrestrial clastics rolled or blown across the lagoons. They flowed through surge channels in the reefs to form steep alluvial cones on the subaqueous talus slopes below the reef rim (Adams, 1965). Upgrowth of the limestone shelves was checked on reaching sea-level. The reefs and shelf edges were exposed to wave action. This wave erosion produced large amounts of talus. As a result the reefs forestepped rapidly beyond the earlier basin margins. Most of the shelf and reef carbonates were partly or completely dolomitized by saturated brines seeping from the evaporite lagoons. The forestepping of the marginal reefs eventually closed the narrow strait between the Star Mountain arch and the Marathon Mountains (southwest). With the blocking of this strait the Delaware Basin was converted from a Mediterranean-type gulf to a deep evaporite lagoon with great evaporite deposits in the Ochoan (Adams, 1965). Toward the end of the epoch, flourishing carbonate reefs and banks on the basin margin greatly reduced the rate of sedimentation in the central area and further restricted circulation. Thus, the scanty sediments that did accumulate were high in preserved organic content (Hills, 1984). By the close of Guadalupian sedimentation, the underlying Leonardian sedimentary rocks were buried several thousand feet deeper under the Guadalupian overburden. The Permian Basin was tectonically stable which provided stability for sediments compaction. About mid-Ochoan time, a new epoch of sagging occurred, practically coextensive with the ancient Tobosa Basin. 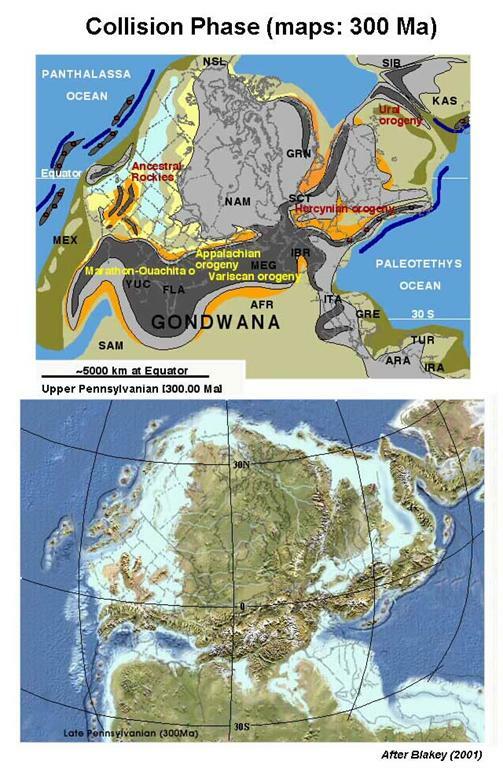 The Ochoan lagoon expanded eastward and northward, and 1,500 feet of evaporites precipitated over the northern and eastern margins of the Delaware Basin. A marine incursion late in the Ochoan spread the Rustler Formation over the western part of the Permian Basin; it is largely dolomite and limestone within the limits of the Delaware Basin, but grades outward to evaporites. Then a shroud of fine red clastics terminated the Permian deposition in the Delaware Basin area (Adams, 1965). At the margins of the basin, the Guadalupian series is composed of reef bordered limestone shelves, which protected many evaporite lagoons. In the central parts of the basin, the sediments were mainly sandstones and siltstones. The continuing restriction of the seas resulted in deposition of the Castile evaporite in The Delaware Basin, which was filled with a nearly impermeable sedimentary blanket 600 m thick (Hills, 1984). Dolomitization developed, due to the circulation of saturated brines from the evaporite lagoons. The closing of the strait at the south converted the entire Delaware Basin to an evaporite lagoon. The post Permian sediments are terrestrial clastics, deposited during the Triassic subsidence, along with lower Cretaceous sandstones and limestones and upper Cretaceous shale and flagstone. 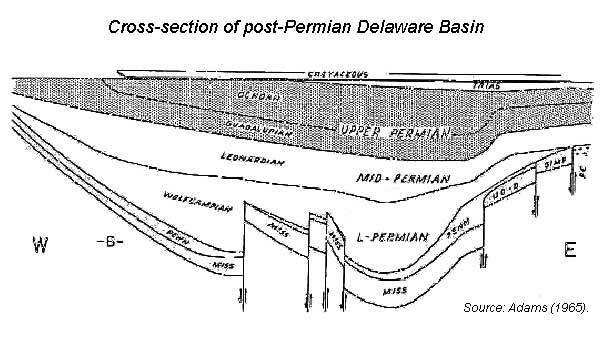 The post-Permian history of the Delaware Basin area records the development of an Upper Triassic sag superimposed on the upper Ochoan Basin deposits. This depression was filled with about 1,000 feet of terrestrial clastics. The Lower Cretaceous Comanchean sea spread a thin layer of sandstone and limestone completely across the basin. Some Upper Cretaceous shale and flagstone also are preserved in early salt-solution troughs along the southern margin of the basin. 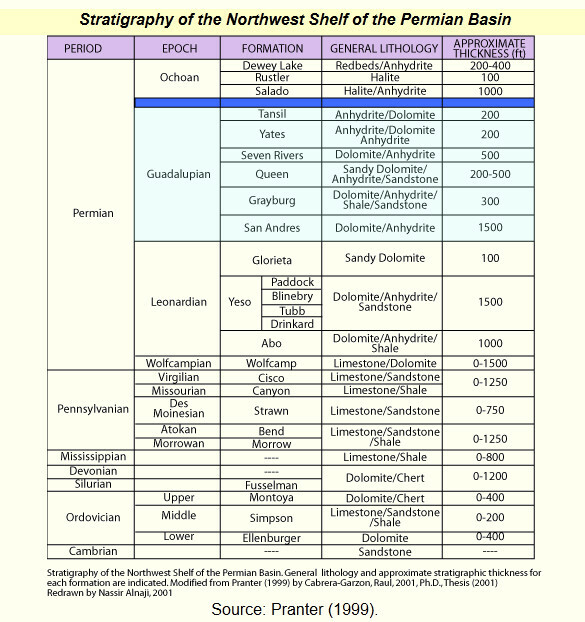 Evidences of extensive additional post-Permian to recent salt solution are found in many other areas. Basinal Guadalupian and Leonardian rocks cap the Delaware Mountains at the western edge of the basin. These mountains, uplifted by Tertiary and Quaternary faulting, form the Cordilleran front and relate this basin to the Rocky Mountain province. The uplifting was accompanied by minor intrusions, lava flows, and considerable faulting (Adams, 1965). Mobility rates were low and no significant structures formed within the basin (Horak, 1985). The western side of the Permian Basin was elevated up to 4000 ft. The basin was permanently raised above sea level during this time (Horak, 1985). 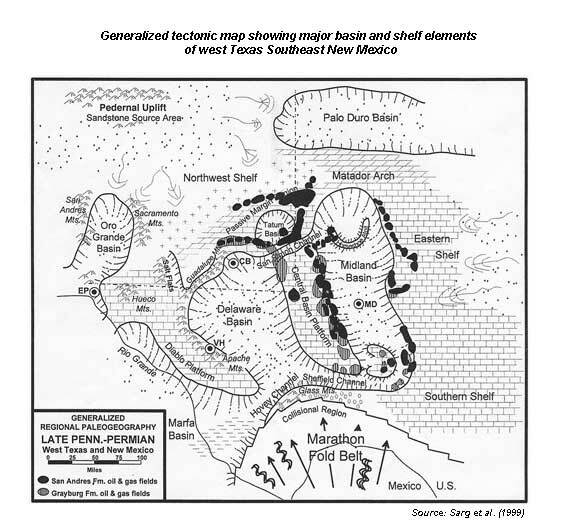 Weak extension and crustal thinning followed the Laramide orogeny, which resulted in widespread volcanic activity and increased regional heat flow in the southwestern Permian Basin (Horak, 1985). Rifting, crustal thinning, and high heat flow characterized the region from the western Delaware Basin across the southwestern U.S. to California. 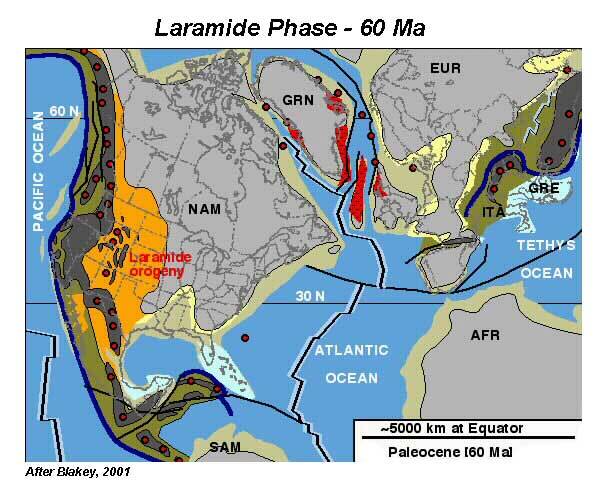 Since the Permian, the western margin of the Delaware Basin uplifted about 9,000 ft, half of this uplift occurred during the Neogene (24 Ma) and the other half occurred during the Laramide orogeny (Horak, 1985). The figure above illustrates subsidence curves from different areas of Permian Basin and highlights the major tectonic phases and periods of most active basin development. for more details on the general stratigraphy of the basin. Tectonics, Sedimentation, Paleogeography of North Atlantic Region: The top map shows the continental plates and intervening oceans, tectonic elements, and sedimentary facies; the second map shows hypothetical paleogeography based on the tectonic/sedimentary map. 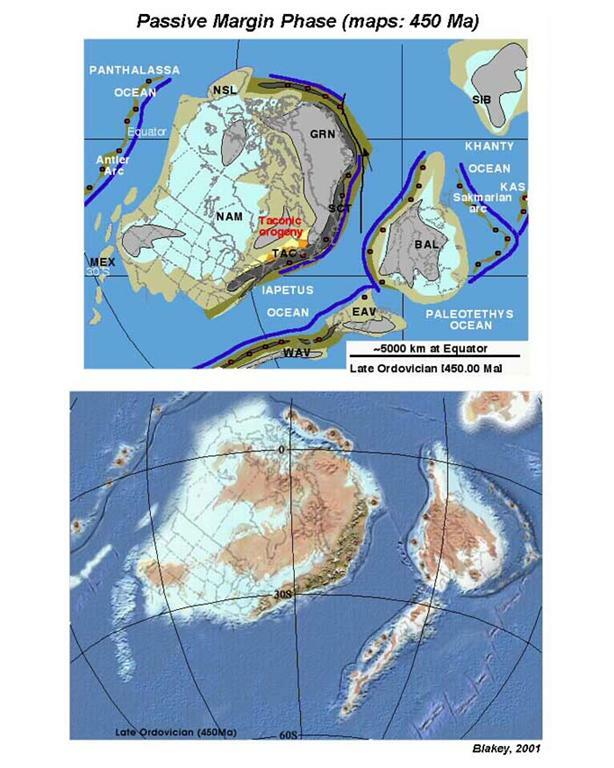 First Order Global Tectonic: Features including oceans, continents, plate boundaries, subduction zones, mid-ocean ridges, and mountain belts are shown on each map. In the latest Precambrian and early Paleozoic, the super continent Rodinia, centered about the south pole, broke apart as blocks drifted northward. Most notable of these blocks were the large continents North America [Laurentia], Baltica, and Siberia. Numerous plates and continental blocks approach North America from the south and east. The Taconic arc has just collided forming the Taconic orogeny. 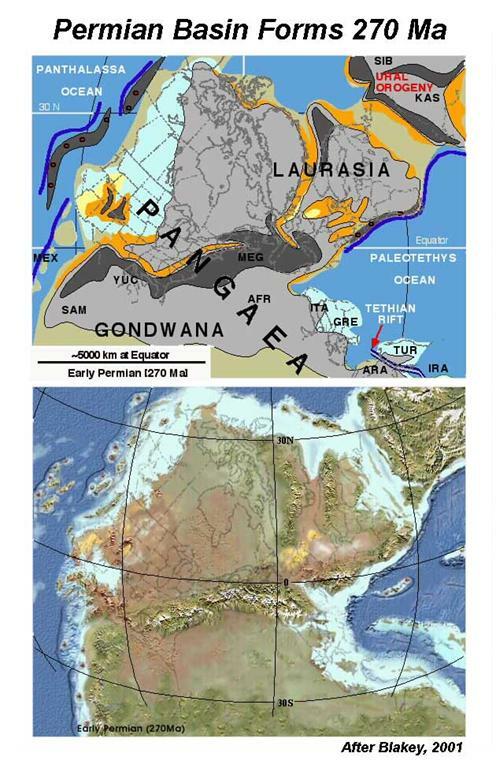 Laurasia and Siberia collide to form Laurasia; meanwhile Gondwana collides from the south. The resulting Appalachian, Ouachita, Marathon, Ural, Variscan, and Hercynian orogenies formed some of the largest mountains of all time. The Ancestral Rockies formed in west central N. A. During the latest Paleozoic into the early Mesozoic, Pangaea lay extant, across the equator. 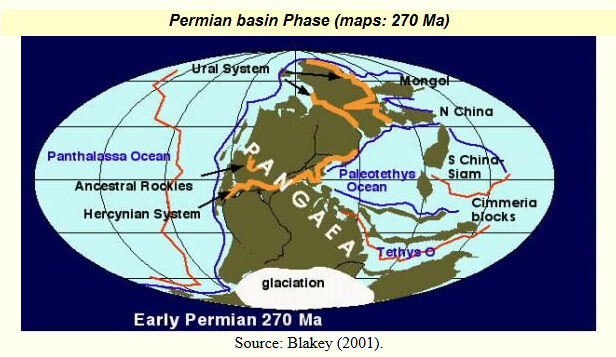 The super continent Pangaea dominates the Permian Earth. A new arc approaches western N. A. A new spreading center forms as Cimmeria rifts from Gondwana and marks the opening of the Tethyan Ocean. The great super continent begins to fracture and the central Atlantic and Gulf of Mexico are born. A great arc is built on western N. A. and the Nevadan orogeny begins. Cimmeria begins its collision with Laurasia to form the Cimmerian orogeny. As plate positions continue to adjust to the opening of the Atlantic; while the Rocky Mountains, Alps and Pyrenees are formed. The modern patterns of Planet Earth begin to appear. Southwestern North America intercepts the East Pacific Rise and a great extensional event, the Basin and Range orogeny begins. Orogeny continues in the Mediterranean region and India nears its junction with southern Asia.